The first club competition of the season took place on Sunday when 23 members braved the chilly conditions to take part in the Rose Bowl, a singles handicap. In the top half of the draw, Terry Corfield negotiated a tricky route to the final by defeating Wayne Graham (21-12), Kez Adams (21-17) and in the semi-final, the in-form Dave White (21-13). Terry’s opponent in the final was his Harriers team-mate Peter Croston, who had overcome Laurie Townson (21-11), Alex Rimmer (21-12) and Ken Rimmer (21-9). The final was expected to be close but Terry continued his excellent form by winning 12 out of the first thirteen ends to establish a commanding 20-5 lead. Peter was able to stage a mini-revival by winning four consecutive ends but Terry scored the single chalk he needed to win the final 21-9. Congratulations to Terry on winning his first Hesketh Arms title. A plate competition was run for those losing their first game and this was won by Club President Sue Davies with a 15-10 win against Lynne Smith in the final. Members are reminded that the next internal competition will be the Spring Pairs, which will take place on Saturday 11th May, starting at 12 noon. Pairings will be drawn randomly on the day – please register by 11.45 am to ensure a prompt start. Singles Competition Sunday 14th April 2019 Start Time 12.00 Noon, Please arrive at least 15 minutes before start time to register. Don’t forget Car Parking Restrictions. The first club event of the season took place on Sunday when 24 members took part in a Round Robin. Fourth place went to Ken Rimmer with a score of +12. Wayne Graham and Len Southworth were joint second with +13 but the clear winner with an aggregate of +19 was Norman Simpson. The first club competition of 2019 will be held on Sunday 14th April when we will be competing for the Rose Bowl. This is a singles handicap and will start at 12 noon. Please report by 11.45am to ensure a prompt start. Full Membership applies to those members playing for one or more of the league teams and includes the payment of league fees and cost of fixture books/cards. Social Membership is available to members who wish to play on a casual basis. If paying online, please indicate clearly who you are paying for and let me know by text (07752352065) or email (michaelmilne66@outlook.com). Members and guests are reminded that when using the Hesketh Arms car park, the car registration number needs to be entered in the console situated at the bar inside the pub. Failure to do this will result in a charge being made to the owner of the car. When playing in weekend events, a contribution of 50p is required for cups of tea and coffee. This is to cover the costs of providing supplies. Please note that the green will unavailable for use by members on Sunday 7th April, as it is being used to host the Southport Champions Trophy. Spectators will be welcome, play starts at 11.00am. The green will be open to members from Saturday 30th March. Please note you MUST ADHERE to the car Parking Rules as displayed in the Car Park. We have been unable to negotiate any concessions at this point in time. The first club event of the season will be a Round Robin, to be held on Sunday 31st March, starting at 2.00 pm. The popular midweek Round Robins will commence on Tuesday 2nd April. These events, hosted by Peter and Lynne Smith, will then take place every Tuesday and Friday throughout the season, commencing at 10.00 am. Please arrive in good time to allow the draw to take place. These friendly sessions are ideal for new and experienced bowlers alike and are an excellent way of meeting other club members. All team fixtures are now on the web site with links to the League web sites. Many thanks to all those who attended the Club’s AGM, held on Monday 18th February at the Churchtown Conservative Club. We are grateful to the Conservative Club for allowing us to use their excellent facilities. 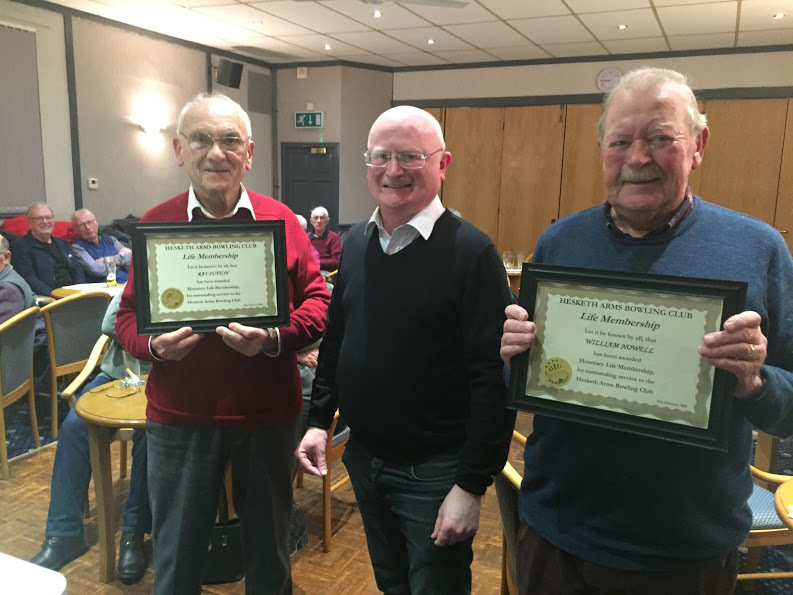 The meeting concluded with the announcement that Bill Nowell and Ray Sutton had been granted Honorary Life Membership of the Club in recognition of their longstanding and loyal service, both having been team captains and served on the Committee. Bill was Club President in 2013/2014 and Ray in 2015/2016. Congratulations to both on this well-deserved honour. The Club’s seventh annual Awards Evening was held on Saturday at the Churchtown Conservative Club, when members celebrated a successful 2018 season. The evening was again compered by Club Chairman, Chris Harding, who congratulated all the members on another excellent season. Awards were made to the winners and runners-up of the Club’s nine internal competitions and team merit winners, details of which have been reported during the course of the season and in the 2018 Season Review. These were followed by the Club’s special awards, presented to the Team of the Year and the Club Member of the Year. The team award was again keenly contested, which several of our teams enjoying successful campaigns. The Kites (Parks League), Vultures (Burscough League) and Hawks (Aughton League) all achieved either promotion or knockout cup success but the final choice was between the three teams that had finished as champions of their respective divisions. In the Southport LV League, the Club achieved a notable double, with the Harriers winning the 1st Division and the Eagles finishing as Premier Division champions, the first time this title had been won by the Hesketh Arms in over twenty years. Our third champions were the Owls, who under the captaincy of Sue Davies, won the league and cup double in the Maghull League 4th Division. As several members of the Committee are either captain of one of these teams or play for them, an independent panel was appointed and the 2018 Team of the Year was adjudged to be the Eagles in recognition of winning the LV League Premier Division. The trophy was accepted on the team’s behalf by Chris Harding, who has been captain of this team for nineteen consecutive seasons. The final presentation of the evening is made to the Club Member Of The Year and this year it was deservedly awarded to George Hitchmough. George has been Club Secretary since 2011 and in addition to the usual duties involved in this role, George has set up and administered the Club’s website, overseen numerous maintenance projects at the green, organised the Club’s social and fundraising events and provided a vital link to the Conservative Club, which we use as the venue for our functions and meetings. George has also been a successful captain of two of our afternoon teams, the Hawks and the Merlins. The Committee would like to thank the Churchtown Conservative Club for allowing us to use their excellent facilities once again. Thanks in particular to Gill for her hard work on the night and to Brian Whitley, who helped Gill behind the bar and with laying out the buffet. Many thanks to Jason Chapman and Jon Roberts for their help selling the raffle tickets. A special mention must go to George Hitchmough for co-ordinating the arrangements for the whole evening and to Sue Andersen, who helped George with the catering. Finally, thank you to all those who supported the event by attending on the night and providing prizes for the raffle. Final proceeds came to £385.30, which will go towards Club funds. The Club’s annual Awards Evening will take place on Saturday, 2nd February at the Churchtown Conservative Club, starting at 7.30 pm. As well as presentations to the successful players from the 2018 season, there will be a buffet supper, quiz and raffle. To order your ticket, priced at £5.00, please contact any club officer or your team captain. All proceeds from the night will go towards club funds. Members are reminded that the Club’s Annual General Meeting will be held at the Churchtown Conservative Club on Monday 18th February, 7.30 pm start. Any proposals should be with the Secretary before Thursday 17th January. Although the green has been closed since the beginning of October, the Autumn and Winter months are still a busy time for the Club’s Committee, with essential works being carried out on and around the green. Almost as soon as the green closes at the end of the season, Andrew Church and Lancashire Turf Supplies are given to access the green to enable them to carry out the annual maintenance work, with is crucial to us maintaining a good playing surface for our members. This was particularly important at the end of last season given the unprecedented weather conditions we had experienced during the summer. The Club is again indebted to our Honorary Vice-President, Mr. Bernard O’Malley, of Nationwide Produce, for his generous assistance in funding this work. Bernard has been a staunch supporter of our club for a number of years now and without his support we would not be enjoying the facilities we have today. The Officers of the Club would like to thank Graham Meadow for his hard work in organising and co-ordinating various jobs around the green, including improved access to the club from the carpark, the replacement of boards around the edges of the green and surgery on several trees which were causing damage to the green. The Club will again run a varied programme of competitions and events during the 2019 season, starting with a Round Robin on Sunday, 31st March, 2.00 pm start. Firstly, the Championship Cup and Ladies’ Championship have been brought forward to the beginning of June to avoid clashing with holidays and other events. As we now run four club pairs, the Chairman’s Shield will be non-random this season, meaning that members can enter the competition with a partner of their choice. The President’s Day will commence at the earlier time of 11.00 am due to the larger number of attendees at this event in recent seasons. This should result in an a more timely finish to the competition.